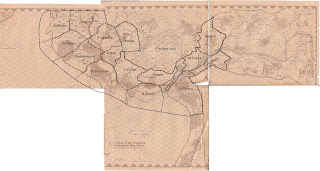 Every campaign has a beginning and it is no different for the Majestic Wilderlands. I knew I started the using the Wilderlands sometime during the very early 80s but wasn't sure exactly when. Now thanks to a fortuitous discovery by my long time friend, Brian, now I know it is was sometime in the early part of 1981 before March. 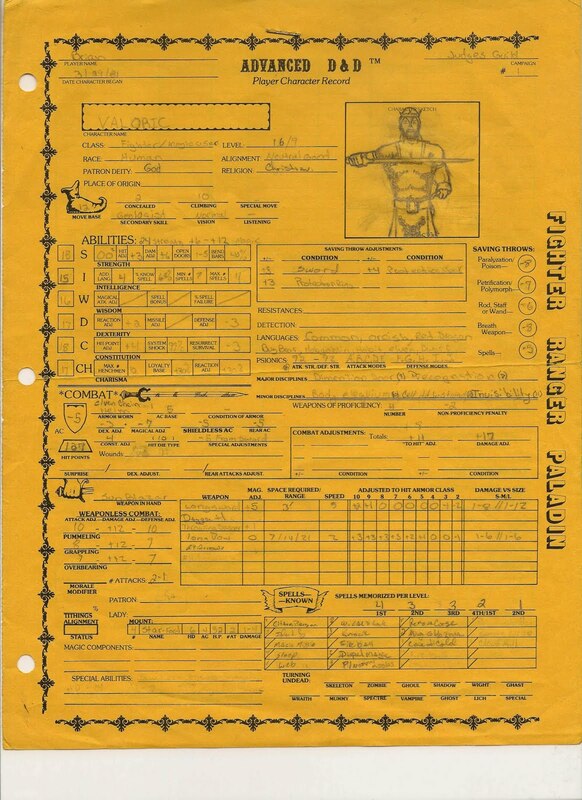 Brian found his original Holmes Box and Rulebook and inside the box were some of the original character sheets for Valeric (or Valoric depending which one you look at). 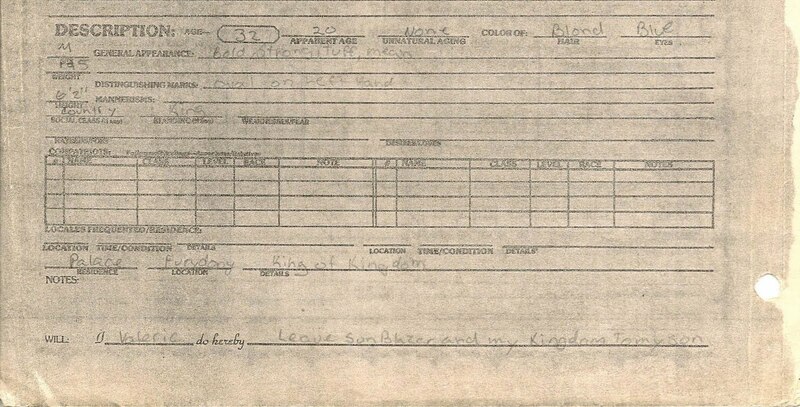 Below is a copy of the front and back of his character sheet. The campaign first started in Greyhawk. It revolved mainly around two characters, Brian played Valeric and another friend played a wizard named Blackstone. In Meadville at that time people hopped campaigns all the time so characters came and go. But Valeric and Blackstone were at the heart of this campaign. When they started to reach name level I decided to do something cool and make Valeric the lost prince of Furyondy. The king of Furyondy was killed and the whole realm fell apart leaving it open to the depredations of Iuz and the Horned Society. The first few sessions were sort of OK. I was in 9th grade at the time and just didn't have the knowledge to do really do a cool political/military campaign. What I really hated is what I still call the "Howling Emptiness of the 30 mile hex." 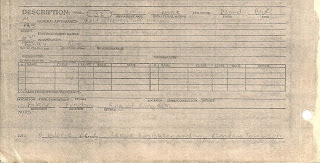 One of the character sheets shows this period of the campaign. If Greyhawk was all that I had, I probably would have stuck it out and figured something out. But I also just got the Wilderlands of High Fantasy. And it had detailed terrain maps, traveller style listing of locales, the works. I could focus on crafting the politics and stuff I liked and rely on the Wilderlands for the low level details. Below are the campaign notes I created. I bought two copies of Wilderlands of High Fantasy and drew further notes on the second set of maps. Below is an annotated map and here is a link to the original scans. 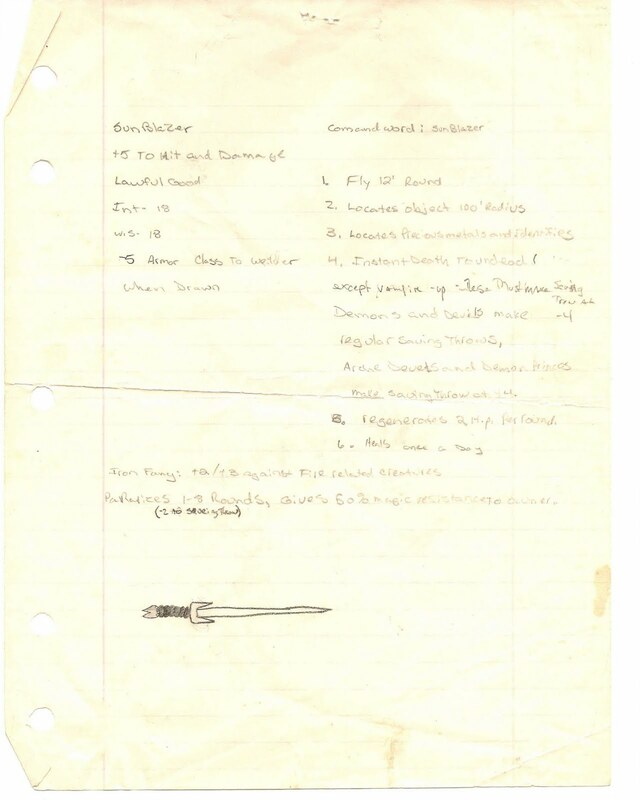 By far the best part was Brian not only finding Valeric's character sheet but also the original write up of Sunblazer one of the 13 Swords of Power. The stats in Majestic Wilderlands were based on my hazy memories. I knew it was a powerful and try to recreate it as best as I could. But the true original version was a bit well... you can see for yourself. Plus as a bonus there is Iron Fang which I have no memory of. It might be something I handed out or something from another person's campaign. I think it is a dagger. Gives 50% magic resistance to the owner. This campaign started at 4433 BCCC, the year all the Judges Guild products were set at originally. Every year of high school I advanced the timeline one year. When I went into College it was 4436 BCCC and during my freshmen year is when I ran the campaign that resulted in the paladin Endless Star killing the last Viridistan Emperor. For those of you wanted more detailed after reading the Nome entry in the supplement, I hope this helped. Thanks to Brian for digging this up and letting me take all of you down memory lane. Just to let everybody know, I will be at Erie Con this Saturday running a new Swords & Wizardry adventure at noon. And if there is interest another adventure late afternoon. It will be held at the Avalon Hotel in Erie, PA.
Update: I realize the con page behind facebook. Here is a link from a post on a boardgame forum. and here is the flyer he sent me. I been methodically painting the remaining unpainted miniatures in my collection. Shamed by the nice dwarven forge miniatures I got a few months ago (thanks to a gift certificate from Jerry of Gold Star Anime), I been began painting miniatures again. At first I focused on the resin props and now going into some of the unpainted monster figures. I am starting with the orcs. 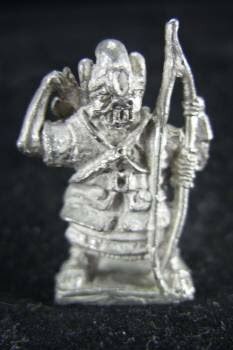 I got all the generic orc figures done and now I am tackling my unique figures. 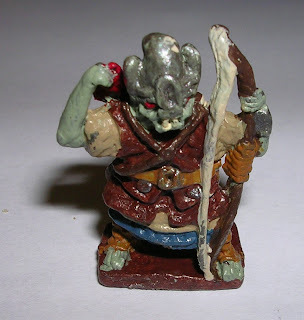 For a long time I had this "thing", some misshapen lead blog representing a orc, hobgoblin or something holding a bow. So after priming everything I decided to tackle it first just to see how much better it would look. I am pleased with the results now you can tell it is something orcish. Although I am now wondering if it is some weird vampire orc from Tekumel. Next I decided to tackle one of my simpler unique orcs. 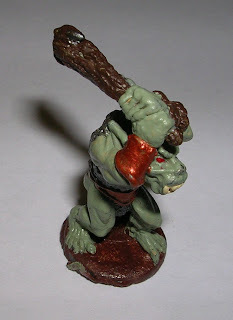 Basically a big brute wielding a club. In case you are wondering what I am using for the orc skin color it is Italian Sage. Then I painted the mule figure I had. I need to paint the base and then glue it to a wider base. It gotten to be known as the narcoleptic mule from all the time it fell over. 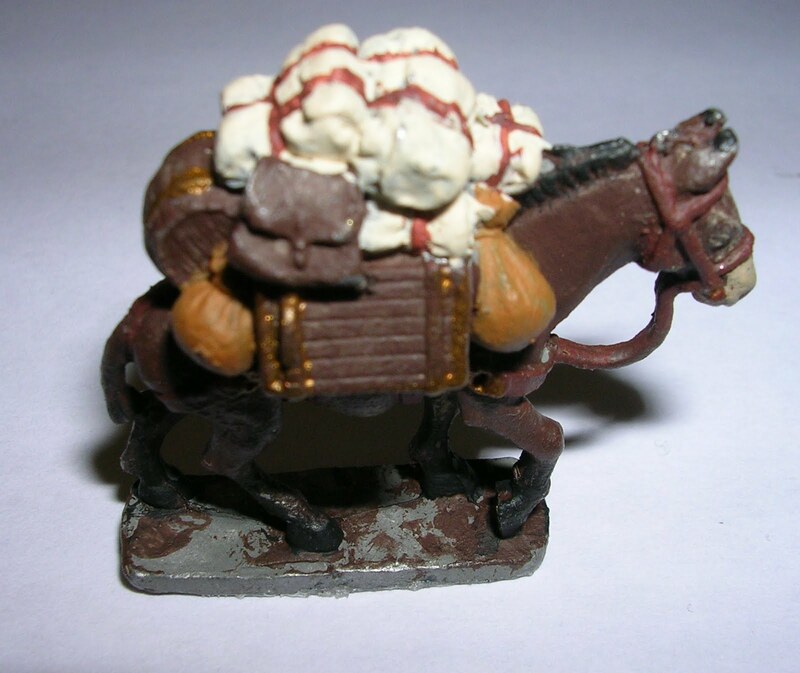 The baggage on top was painted with a color called linen. Sort of a brownish white which makes a nice cloth color. All the paints I got are acrylic paints from Wal-Mart or Jo-Ann Fabrics. I protect the completed miniature with a coating of matte Mod-podge. He mentions that it came from a Heritage Model set called the Crypt of the Sorcerer. I still have the map somewhere. Who ever has this model has a worse one than mine as the area between the legs is filled in with metal. On mine it is free of metal. Creativity can't be taught. Yeah so what! Hill Canton's Building a better GM got me thinking further on how I got to the point where I am today in refereeing and writing for RPGs. It is accurate to say that people are born with an artistic talent or not. That if you don't have it in you no amount of practice and study is going to allow you to match the top performers in a particular art or craft. But it is irrelevant. Because you are not in competition for a publisher's slot, or a role of a lifetime for a movie. The only person you need measure your creativity against is yourself. And there are a hell of a lot of things you can do make yourself more creative today than you were the yesterday. I know everybody can learn to be a good referee, if they have the interest. I also know that it is not always apparent that a person will be a great referee at first. Sure some just pick up the dice and books and never look back. But for many it is more of a matter of playing and learning until that day comes when it all comes together for them. How I know that? Because that my story. I have a learning disability in language skills. When I was six years old, I had scarlet fever. Afterwards my doctors found that I suffered a 50% hearing loss because a chunk of my nerves got burned away or something like that. And it isn't a 50% decrease in volume either. It 80% at one frequency and only a 20% loss at another. So they figured out my hearing profile and I got hearing aids. Then later they found the really sucky part, apparently it just didn't get my nerves, it hit where it they entered my brain. It takes me two or three times as long compared to a normal person to learn speech, writing, spelling . Also it made learning foreign languages a long drawn out process. All throughout school my scores were like 90% math, 100% science, 100% history, and then 60% English. So in the middle of all this comes Dungeons & Dragons. Which I am sure you all realize by now is something I really like. 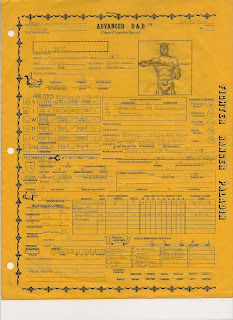 And if there is one activity that needs language skills, that activity is Dungeons and Dragons. It was not the only thing driving my improvement in language, I have my mother to thank for much of it. She was a teacher for several decades and she really helped me. But Dungeons & Dragons provided that extra boost for me to keep going even after I moved away from home and was on my own. And I kept writing year, after, year, over decades. And I am still not finished. All of you reading this blog have seen dropped words, misspellings, switched letters. All I can do is keep practicing and make sure my published material is not edited just once, or twice, but several times. I have Tim of Gothridge Manor to thank for helping a lot with that. Because of the hearing loss, I struggled with running a game. It was hard, and while hearing aids helped it is a not a universal antidote. The main issue is that I can hear certain voices better than others. For me running a tabletop is a challenge. 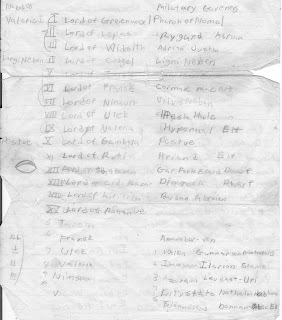 At one time I had a tape of the "The Great Party Fight." I had two groups of players at the same AD&D game. The groups had a history of backstabbing and were always threatening each other. I was getting kind of fed up with the trash talk so for this session I instituted the rule that what you say is what your character does. Well I thought the player said "I backstab him with the sword." So I told him to roll and the party proceeded to kill each other. 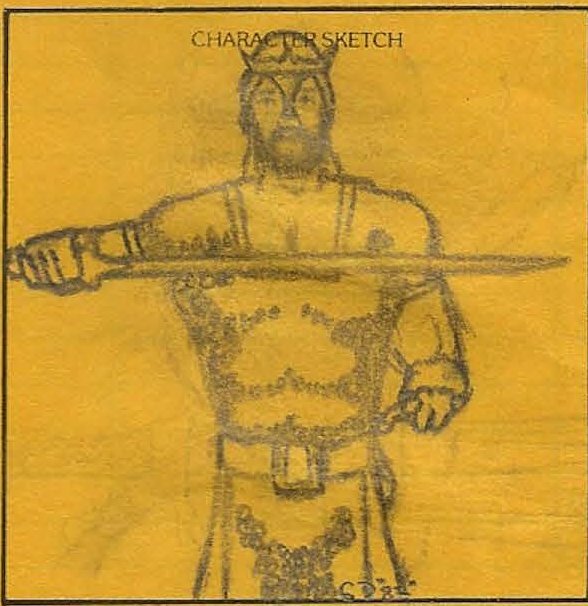 It just so happened we recorded the session and when we played the tape back, what the player really said was "I ought to backstab him with the sword". Because of my hearing loss I really had to play attention to the way I referee. Which lead to me thinking about how to prepare, run adventures, interact with my players, and all the other things that make up a successful campaign. I also learned that it not a one size fits all deal. Depending on the genre, situation and players, different techniques need to be used. Roleplaying is a young hobby, we only scratched the surface of what you can do with it or how teach it. If I can learn to be a good referee, I don't see why anybody can't either. Hill Cantons ignited an interesting discussion on Building a better GM. First I read books and watch movies. Both for enjoyment as well as keeping an eye on how they do things. Twenty years ago, I gamed with a guy named Wes and we went to a couple of movies. He was a movie buff in addition to being a gamer and he had a gift for explaining what was good and bad in a film. It was an eye-opener for me and I never looked at movies in the same way again. Afterward I learned a lot of little bits that I incorporated into my game. Mostly dialog and how two actors played off of each other. I also read lots of books and found them a great source of inspiration. I do this to build up a bag of stuff in my head to pull out while running a game. A bigger bag of stuff means you have more options for when the player talks to the tavern keeper, arrives at royal court, or just stumbles across a peasant's hovel in the middle of the forest. The key thing is to take some quiet time and organize things in your head. Think about a peasant, an orc, a kobold, etc and then ask yourself a series of what if. 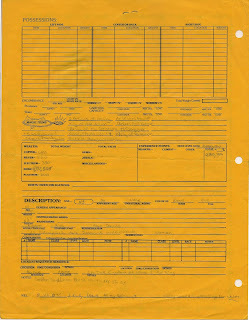 There is no right answer and you don't need to be Star Trek's Data and have perfect recall. Do it enough times it will come to you when you need it. This technique shares some ideas with that of the Memory Palace. The best part is that you likely have much of what you need already due to being exposed to fantasy and other genres over the years. Another technique is to challenge yourself. Conventions are perfect for this. Run some situation, genre, or game that you never done before. The idea isn't to change your style of play but to broaden your experience. By experiencing different methods of roleplaying you will understand the ones you like better. 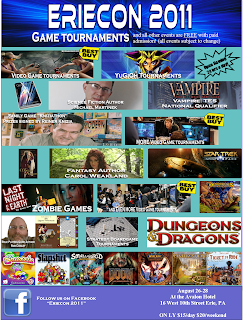 With Google Plus gaming and the virtual tabletop games there are more opportunities today than ever before to try different games at a convenient time. For me it was playing and running a LARP game for over a decade. Writing and running adventures for LARPS is stifling. It is because the physical logistics precludes the flexibility of locations, creatures, and items, that you have for tabletop. 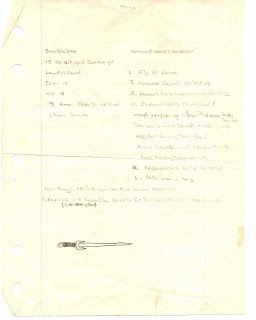 Despite the limitations I learned to write fun adventures for LARPS and it helped my tabletop game immensely. Another thing I did was run a dungeon adventure cold. All I had was the stats for the big bad guy, the map, and a general idea that it was a coven of warlocks. I just made it up on the spot as the players went through the dungeon. Knowing that it was a coven keep things from getting incoherent. Also surprisingly running Tegal Manor. The sparseness of the description, (a room name and maybe a sentence or two) has really forced me to reach deep into my bag of stuff to keep the game going. I always done it with my sandbox campaigns but since Tegal is a funhouse dungeon it forced me to go outside of the things I done before. On a different note, I been refereeing large groups of players at my Gold Star Anime games. One session I had ten players. This is something I hadn't done since the early 80s so I had to relearn a few things. Once thing I did was figure out how to keep individual initiative. Basically everybody roll for initiative. I roll once for each group of monsters. In my games the DEX bonus gets added to the die. Fighter get to add their to hit bonus from their class. For monsters I add 1/2 hit dice. So I start at 10 and count my way down calling for anybody who has initiative at that number. I found this works just as fast as doing single die initiative and going round robin around the table. Split groups don't bother me, I just go round-robin between each group giving them 5 minutes at a time. 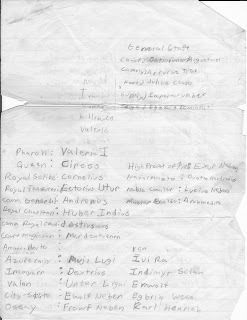 There is my How to Build a Fantasy Sandbox for preparing a campaign. I always have players speak in first person when they speak as their characters. I find it helps immersion. I do the funny voices, I also practice so I am pretty comfortable doing them. I understand it is not everybody cup of tea. If you use miniatures, the best thing you do is take all the most commonly used items; beds, tables, orcs, guards, chests, doors, etc and put them in an easily accessible box. I use foam lined bead trays bought from Wal-mart. Plot in my campaign is a time-line of events that would occur if the players don't do anything. It gets changed (or not changed) after every session to reflect what the PCs did (or not do). I have a roster of NPCs. The creativity comes from deciding how the NPCs react to the PCs. I try to sit down with each player and do a one on one session to develop their character background. Then incorporates elements of that into the campaign's plot. I make sure there are as many potential benefits as there is potential complications from doing this. I have way more than the three Hill Canton asked for, I hope you find them useful. I will be running the Night's Bride Coven at ErieCon in Erie, PA on August 27th at Noon. 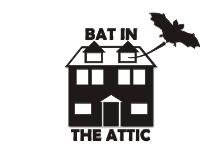 It will be held at the Avalon Hotel. Saturday August 27th, 12:00 pm, Night's Bride Coven. The forest of Dearthwood has long been haunted by evil. Finally it's source has been located, the foul mages of the Night Bride's Coven. Be part of the band of heroes that strikes down this ancient menace one and for all. 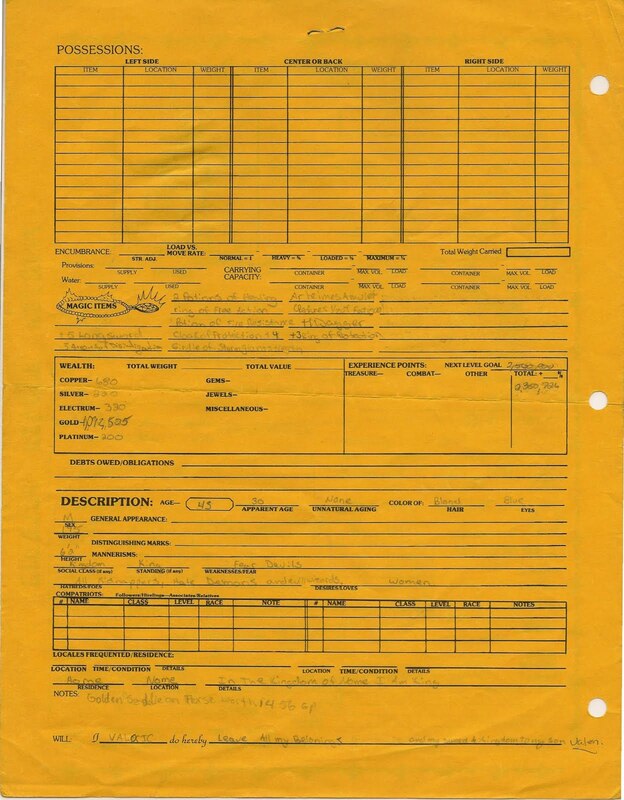 An adventure for the original 1974 rules of Dungeons & Dragons. Rules and character materials will be provided, just bring your dice! Suitable for novice and experienced gamers. One interesting aspect of this dungeon is that it has been delved from a cliff side rather than completely underground. If there is enough interest I will run another dungeon during the evening. Looks like games are coming to Google Plus in this announcement. What makes this of interest to us is that they will be having a developer's program which you can read about here. Eventually we should get additional tools, like dice-rollers, that will enhance Google Plus for table top games. Neverwinter Campaign Setting, seriously you can read the press release over on Dorkland! This and the Gates of Neverdeath, I have to say I got to wonder what going on over at Wizards. There are dozens of example of city books, in fact I was involved with one a couple of years back. It based on the very city ever to be described in a book for a roleplaying game. Let's look at the real first-ever RPG book focused solely on a city. It no longer in print, but you get a PDF from RPGNow. Both the original and the Necromancer version. 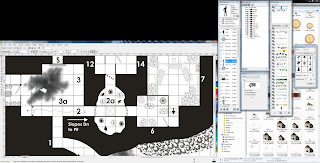 Saturday was D&D Game Day, while Tim of Gothridge Manor was working on perhaps the most quintessential activity of older D&D, creating a random dungeon. I on the other did one the most quintessential activity of 4th edition D&D, ran a canned adventure of encounters for D&D, "Gates of Neverdeath". I did some prep for the game. Not the actual adventure of course, Instead I went through my miniature and props for stuff to use and to make the encounters visually exciting for the people attending. Here the results The ship encounter when the party first sails into Neverwinter. When this picture was taken, Josh's Goliath just pushed the wagon into the water on top of a zombie trying to climb onto the dock. The climatic encounter in the graveyard. The players really like this especially the newcomer who hasn't played with in my Swords & Wizardry sessions. What was most uncanny of the whole session is what Kelly Anne, my wife, got for her character. See in the grab bag that Wizards has for each participant there is a theme care the player can use for their character. This one had to do with the character being a ex-member of the Brotherhood of the Rat (or something like that) give them an at-will power to allow them to change into a tiny rat. 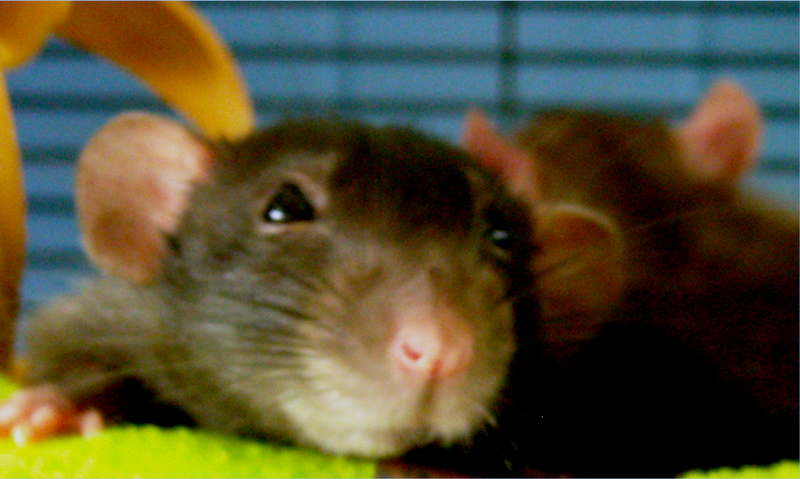 Which makes this ironic is that we have adorable pet rats at home. Years ago I was skeptical and so was Kelly Anne when my youngest wanted to get some as pets. But they turned out to be great pets, a little like owning small excitable dogs rather than the boring gerbil, hamsters, and mice, Kelly Anne had when we were kids. Initially skeptical at playing 4e, she was pretty exciting at playing her thief now. Especially when she had a +14 to her stealth roll as a first level character. The session ended with one party member dead, two members down. Kelly Anne's thief was the only one still standing. The main bad guy was dead but his minions survived and dragged his body away. Overall the party was battered but succeeded in stopping the bad ritual. 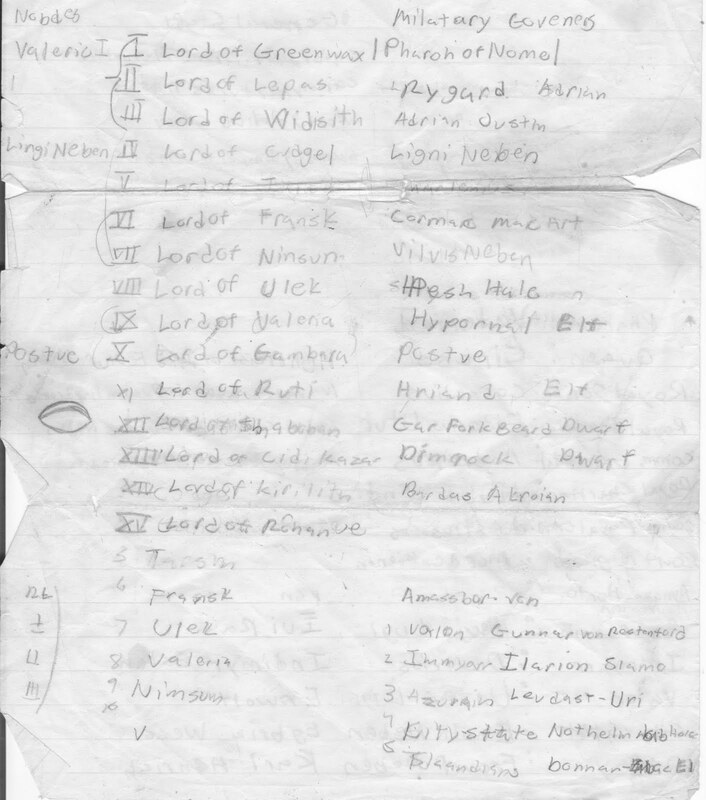 While the session when well, the adventure was some of the worst crap I seen published for roleplaying in a long time. I understand constraints the authors have to operate under. I experienced some of them myself when trying to run good live action roleplaying events. The format imposes limitation on what you can do in terms of plot and the action. It results in a sequence of encounters that is a railroad. But if you write good plot and design inserting encounters the result can be fun for organized play. But those limitations are no excuse for crap. And make no mistake Gates of Neverdeath is crap. The adventure hinges on the main guy stealing the McGuffin. The way it is written the bad guys just appears and there is nothing the PCs can do about it. Railroad combat is one of the things that will piss off players to no end. I fixed it by bringing the bad guy on stage. I practiced the encounter the night before and so my version was fair. If the guy died I would dropped the graveyard as the location where some nasty things were setup and the guards asking the players to go and clear it out. Although this fixes the issue, it shows the problem in sharp relief. To pull this off requires luck and requires a highly skilled referee. My solution is not ideal for use in organized play where skill levels range all over the place. 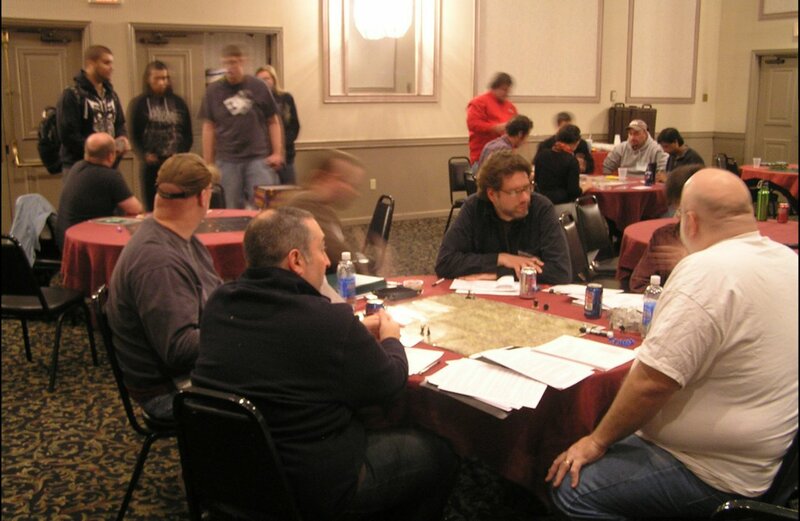 To top it all off, some of the experienced 4e players were commenting how tough the monsters were. I don't play 4e on a regular basis so I had little to compared this too. But looking at the monsters afterwards, they were startled at how they are stated. The hallmark of Wizard's 4e offering is the combat encounter and I am left wondering if standards slipped on this. Wizards should be ashamed at letting this go out with their name on it. And the limitations of the encounters format is no excuse. Been working on one of the maps for Tim of Gothridge Manor Starter Adventure. Had to figure out how to do scorch marks with a greyscale map. I think the end result will look good. Figure do a full screen shot of my two monitor setup to show what it looks like. The right side is a monitor mounted in landscape. I like doing that as I can have an entire page up when I am writing. The mapping program is CorelDRAW. Underneath is all my images from Profantasy Campaign Cartographer. While I don't use Campaign Cartographer much for my professional work I do use the images. 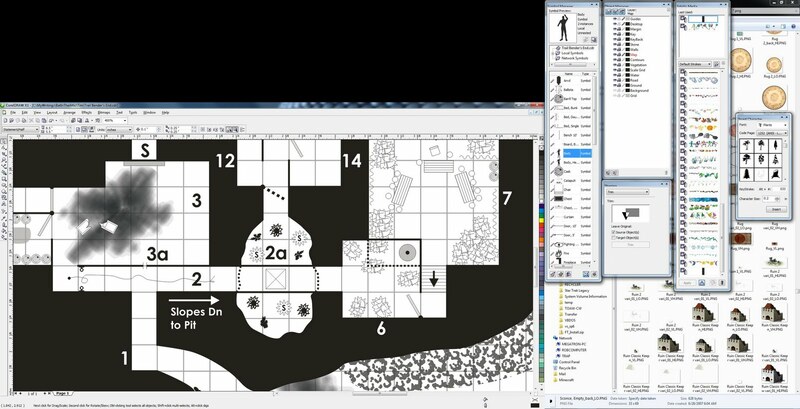 Overlaying the images are all my CorelDraw dockers including my all important symbol palette of dungeon details. I really recommend a two monitor setup for serious work. Triple is even better if you can afford it and have the space. Did some more work on Scourge of the Demon Wolf. I decided a while ago to make it a two in one book. An adventure in the front and a supplement in the back that expands some of the things used in the adventure in greater detail. One part of the adventure revolves around a conclave of the Order of Thoth, a guild of magic-users, called the Golden House. In the supplement half I write about the Order in greater detail than the adventure and the Majestic Wilderlands supplement. I finally came up with a code for the Order of Thoth. I will not raise a hand against my peers except through proper challenge. I will train at least one apprentice to preserve my knowledge. I will abide by the judgment of my peers sitting in a duly constituted conclave. I will defend my peers against all enemies. I will not consort withdemons. Working on something called the Silent Code which is a unwritten body of customs that developed after the foundation of the order. Mostly dealing with how mages should deal with non-mages. Only thought up a few so far. A mage shall not rise above the mundanes. A mage shall not be impious. A mage shall not war without the consent of his peers. The first one developed after a series of mages and conclaves set themselves up as rulers. The main exception to this is the city-state of Tula which is ruled by the order. The second one doesn't cover mage's personal opinions but rather stopping raids on temples and other religious places. A few conclaves ran into trouble after they started a conflict with the local temples and brought down widespread trouble on the Order as a whole. The last is mostly about conclaves and mages attacking rival orders of magic. Against this resulted from conclaves getting into trouble as local conflicts spiraled out of control to effect the entire order. My whole Order of Thoth background originally developed out of a mix of Ars Magica, Harn's Shek P'var, and my own ideas. For publication I am replacing the stuff from other games with my own ideas. 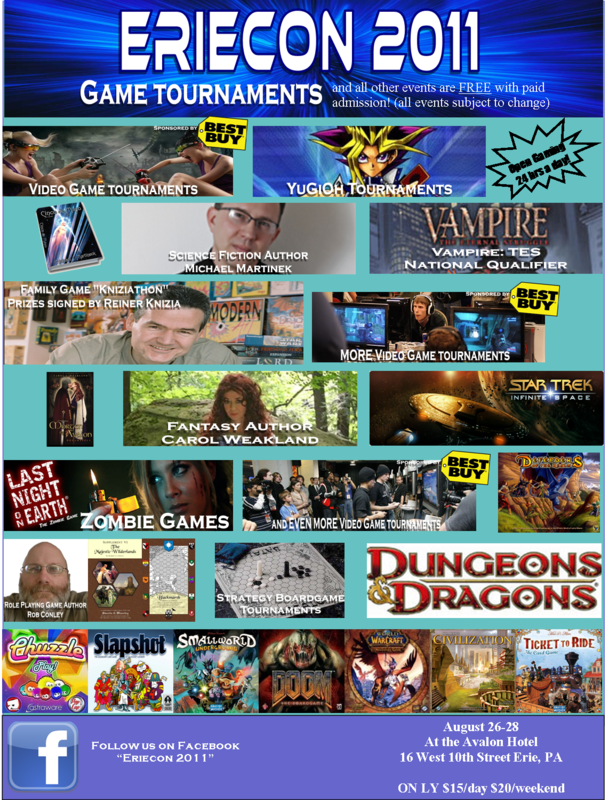 Tim is promoting the upcoming Erie Days of Gaming on the weekend of October 21st. It is a nice local convention that I been attending for a number of years. For many of you it is well positioned between Cleveland, Buffalo,and Pittsburgh about two hours drive from each city. The vendor vary but most years there been a good selection. I plan to be there and try to run at least two games and maybe a third. One will be a Swords & Wizardry game plus Majestic Wilderlands focused on playtesting one of my modules. The next will be a Traveller game using either Classic Traveller or Mongoose Traveller. Likely it will be a Third Imperium scenario. For the third game I am still deciding between GURPS, DCC RPG, or Hackmaster Basic. I will post teasers later in August. Greg ducking as Jason's Elven Wizard is about to be killed by a door in the DCC RPG. Tim looks away in horror, Al stares at me in disbelief, and John is eclipsed by me (sorry about that).